Here you can find out the best way to buy a puppy, how to feed and potty train your puppy and how to keep him healthy. We answer your questions on growth, weight, biting, socialisation and much more. We also have a fantastic community and support network of Labrador puppy parents in our forum and on our Facebook page. The Labrador Site is brought to you by best selling author and Labrador specialist Pippa Mattinson. Don’t miss her lovely articles, tips, and advice. Our puppy section is updated constantly and we are always at the forefront of any Labrador news and information. There is no more extensive Labrador resource anywhere on the internet. It’s all here, and if you scroll down, we’ll help you find what you need. Not all Labrador puppies are healthy, so its important that you know what you are looking for. You’ll want to get potty training off to a great start and here are some articles to help you make sure your puppy is clean and dry as quickly as possible. When can I take my puppy out? Should I have my puppy vaccinated? One of the great things about Labradors is their good nature, but did you know that even Labs need a little help in this direction? You probably can’t wait to get started with training your puppy, and modern puppy training is great fun! Here are some key resources. 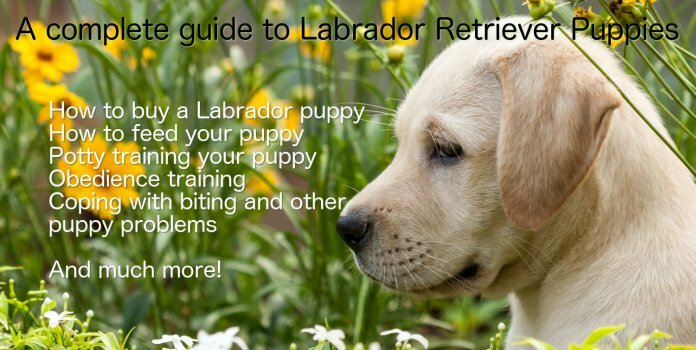 When you’ve read those two, head over to our Labrador Puppy Training Center for links to videos, articles, training guides, books and all the rest of the information you need. This in-depth guide to the first few months of puppy parenthood covers every aspect of life with a small puppy. Also – don’t forget to bookmark this page and come back to read through these fascinating sections. And if you are in puppy shopping mode, don’t miss 10 things to buy for your new puppy! Alternatively, you can browse through our entire library of puppy articles. We don’t just love labradors! We understand them too. 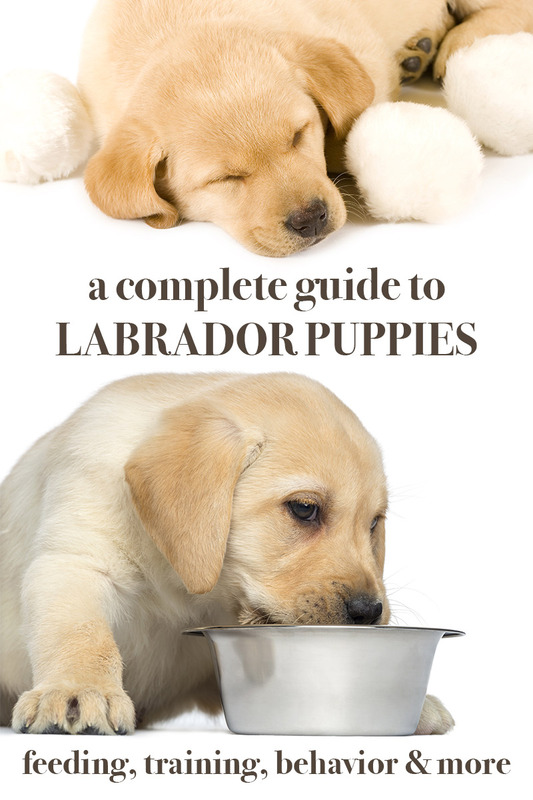 All the articles on this website are original and are written by experienced labrador trainers, breeders, and dog health and behavior experts. Our objective is to help you to enjoy your puppy. And your comments and suggestions are always welcome! Please check our extensive library, using the menu at the top of the page, and don’t forget to join the forum where you can get help and support from lots of other new puppy owners. i love Labradors loveing nature! I am looking for a miniature cho lab puppy and a small lab because I am over 60 and a smaller lab would be easier to handle. We found a puppy in the garbage the day it was born…umbilical cord still attached. It was cold, wet and crying. I decided that I was going to take care of it and if it survived find it a good home. Odds, as you know, were against her but she did make it! She is 4 1/2 months old. We fell in love with her and decided that the only place for her is with us. My pup turned out to be a black Lab. I have never owned a dog & your site has been a lifesaver!! I need help with one major issue….biting! I’ve read your articles. Tried a few things but it continues. She bites us only! She bites when she is excited, wants to play and we don’t and when I take something away from her. I was hoping that playing with other dogs would curb the biting but she isn’t interested in playing with them. Any advice? yourself, give it a tap on there nose and say “no”. Make sure it gets soft (brisket) bones daily. If it is biting you put something else in its mouth. I have a female Chocolate Lab that is seven months old. She chews up everything she can get her paws on. How long will this stage last and is there anyway to put an end to it before I lose all my shoes and slippers. Hi there, hope you find this helpful . https://www.thelabradorsite.com/how-to-stop-your-labrador-chewing-things/ . Do join the forum for advice and support. How do I stop excessive pulling on the leash with a 10wk old lab puppy. Hi Pippa, I have a 4 and half months old Labrador puppy, she is very active and needs 3-4 walks in a day otherwise she starts barking if not taken out side. Steffie ( My puppies name) is on kibbles from the day first when she became part of my family. I am confused with her weight as some of my friends says Steffi looks overweight. May I know the correct weight chart for my puppy. Please help me out. I have a 5 month old Yellow (show) Lab. He is such a good puppy in always EXCEPT he wil NOT stop eating branches and wood chips, pine cones and nuts when he is outside. We live in the mountains, forest all around us. I’m at my wits end. And ideas? I think your site is wonderfully informative, useful and comprehensive and should be read by anyone considering making a labrador part of their family. I read it purely out of interest as I already have a wonderful 11 year old lab who is the most perfect, loyal, obedient, friendly and laid back companion anyone could wish for. I would add that, had I read your article before getting him, I would probably have decided that our situation wasn’t really suitable for a lab but, luckily, I didn’t read it before welcoming him into our home which was one of the best decisions I ever made because, despite all of the disadvantages of having an enormous, bounding, barging, overpoweringly friendly family member, he is absolutely perfect for us and none of us could bear to part with him. We just adjusted our whole lifestyle to suit. Overall, labs are worth every bit of inconvenience purely because they are such a joy. As a breeder and trainer of Labradors, we have a particular training issue that irks us to no end, hopefully Pippa can weigh-in on this with us… many people believe in using shock collars as a method of training their pups which we vehemently disagree with. Labradors are high energy, highly intelligent dogs that are extremely willing to please and very eager to learn. We find shock collars to be a lazy mans forcible training by using the fear of pain. Like any human child, consistent regular attention to your pups training from an early age is all you need, often times people go through the “cute puppy” stage, which they should ask themselves if this behavior would be so “cute” when their pup is an adult dog…and nip that behavior in the bud, early. With consistency and regularity in the fundamental basics of obedience training, pups should never need a shock collar, especially a Labrador. Learned behavior begins at a very young age. Hello, is there any advice about getting two puppies from the same litter at the same time? We’ve reserved 1 male and 1 female from the same litter but have now been told that this isn’t a good idea. Any help would be appreciated as we’ve already paid the deposit on them both! We’re willing to put in hard work but will it be too much for us?! ….As long as your intent is NOT breeding, litter mates CANNOT be bred. As pets, there is no reason whatsoever that this is a bad idea. Consult your Veterinarian for spaying and Neutering… Labradors are high energy, highly intelligent animals that are eager to please and eager to learn. Most Labradors get along very well with each other. Be well aware that taking care of 2 Labrador pups is quite an undertaking for most people, since they are very high energy. Unless you are a professional trainer, it is probably best to separate them and train them individually for the basics. I have 2 dogs. One year old Catahula leopard dog named Dixie, and a 4 month old Labrador named Chloe. Dixie tore open her bed one night. So we removed it. The next day, Chloe tore up her bed too. Is there a way to break this habit that she learned from Dixie? Or is there an article on Labradorsite.com I should read? 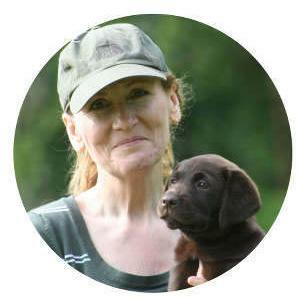 I suggest you join the forum Caroline, where you can talk to many Labrador owners about their experiences and recommendations for training. Modern dog training is all done with positive reinforcement and that is the only method you will find on this website. I highly recommend it. I have 2 puppies arriving in a week and have just finished reading your book ‘The Happy Puppy’, excellent read. They will be 8 wks when they arrive and are Lab x Border Collie. I wondered if you had any training tips on dealing with 2? It’s not my first time with pups, we recently lost our 2 after 15yrs, but thinking has changed slightly and I’ve not used the crate technique which I’m keen to do this time. Thanks in advance for any guidance you have. Great website & book! I have a 13 week Labrador who is partially create trained! She’ll stay nice & quiet when we are out during the day & when we go to bed, but at about 5:30 she needs a toilet, we’ll take her out giving her no fuss and put her straight back in, that’s when the problem starts – she just wont settle when she’s on her own, we have been going back downstairs & staying in the room with her but not letting her out of the create, as soon as we leave she starts barking & crying. We’re worried about just letting her cry & bark because of the neighbours. Can you help? Thanks Claire, have a look at this article: https://www.thelabradorsite.com/night-waking-how-to-restore-the-peace/ Most puppies won’t want to go back to bed after being crated all night. But as your puppy gets more bladder control, you’ll be able to make the ‘night’ last a little longer. Comment:hi pippa. my male lab is about 9 months old. his average weight is about 20 kg. is its for his health? I have a 6 month old yellow male lab. he weights 31.7kg so his a big boy. he is doing really well with obience training but when we are out walking and he finds a stick, he suddley changes behaviour and wont leave it or let me take it. he chews and eats them. if I try to take it he will either keep running away or he jumps up at me and nips. how can I change his behaviour. I have tried taking a ball and toy with us to play with but all he does is chase it then leaves it and goes on the hunt of a stick. Tammie, this is exactly my issue as well! We live in the woods, so I can’t walk him outside without sticks being everywhere. Any ideas, Pippa? Hi Kim, you’ll find some ideas here – “how to stop your lab eating everything” Do join the forum for help and support http://thelabradorforum.com Keeping him busy on walks (with games, retrieving, training ) will help, and at only five months he may well grow out of this. Is there any information on this site that wouldn’t apply to golden retrievers? I would go to the vet and ask for recommendations. I have a 7 month old black lab. Quiet intelligent. His weight is 62 lbs. I m feeding him with royal canine, but his face is not getting punch. Please let me know if he is a pure breed. Is long face a trait of pure breed or not. I have 3 months old lab of 3kg . I just wanna know whether I can give him cerelac or not as he used to have milk with chapatis and banana all the day long and sometime pedigree too. 3 Months old weighing 3Kgs sounds bit worrisome.. coz i just today had first vaccination for my 47 days old male lab.. he weighs 3.1Kgs.. not looks fatty at all….. i started giving him Cerelac (Stage 2 – Rice & Vegetables) since 30th day.. I tried train him ‘Focus’ or Pedigree 3:1 mixing with Cerelac but he gets diarrhea or vomiting after a hour or two…. However, Dr has advised me to train slowly for dog’s food with prescribing a digestive tonic..
i hav a lab cross she is 3.5 months old. what should be her ideal weight. she sleeps or sits alot…is there any severe problem? I have a 4 month old lab puppy. When we took him to the vet for a check up, the vet told that his legs were not straight and suggested that he should walk. So the question I have is that how long should my lab walk in order to be fit and healthy. Also we have a lot of problems potty training him. We tried several methods but none were successful. So I would be grateful if you suggest some…Thank you! Hi, Can a lab puppy be switched to vegan at his initial stage after having non veg? Where..can we assure that he would never have non veg at later stage?? Our 12 week old black lab does the same sometimes. He gets very distressed and cries/jumps/and pulls toward home. Would love some advice. Hi tis is Nina here..I have a chocolate labby of 55 years old..his hairs are falling out..is there any specific reasons? Am worrying abt it..I think he is lacking in his nutrient supplement..please help me hw to handle? I have an 8 week old lab puppy and wanted some advice on nail clipping and bathing. How soon should both happen? I see a lot of mixed information on when/how often to bathe a puppy. The general information I saw for clipping his nails was whenever he needs it so he gets used to it. I have a new lab puppy (9 weeks) and I am having trouble house training him. The first week we had him he never messed in the house and now he can’t hold it. I get up 2 times a night with him midnight, 2 am and then 5am. Is this enough or should it be more? Also, what I don’t understand is that he holds it for 8 hours while my wife and myself are at work. I have a 2months and 4days old labrador puppy. Hes fur was falling. Is that normal? Do I need to Change he’s shampoo? Hi ..my Labrador female had just deliver the pupies n now they are 10 days old and I want to that can I feed them cerelec becoz mother female is not gaining much milk due to that puppies are not getting suficent feeding help me what to do..
Hi JUST BOUGHT A LAB RETRIVER PUPPY BORN 1/29/15 HOW OLD DOES IT MAKE HIM? WAS TOLD HE WAS GIVEN HIS PARVO SHOT WHAT ELSE DOES HE NEED BEFORE TAKING HIM ON WALKS/PARK HOW OLD DOES HE NEED TO BE? ANother thing i wanted to add, was that pickles is chasing our son, he ripped his pants yesterday and my son is terrified of him! We have told him to stop, but he never does ! Please help! 1. Mrs Smith has left her two twelve week old Labrador puppies with you for one week. Their names are Hudson and Cooper. She noticed that Hudson tends to scoff all the food and Cooper may miss out. a) On admission what are their weights and body scores? b) What premium dog food would you offer? Why? f) Is there another way you can present the food to help reduce this scoffing behaviour? (You can include diagrams to support your answer). g) What is the easiest way to monitor their water intake? hey there, i have a puppy which is about 1 month 12 days old. She is not very active, She always wished to sleep or always try to rest at a certain places. Is this is a normal thing or it is common for all one month old puppies. Hi I have a 10 months old lab I give him a half a glass of milk with boiled vegetables and veg pedigree for taste is it good to feed him milk at this age???? My lab is 2+ months old actually i wanted to know can i change the food brand? Hi, i have a female lab n its about 1 and half months old, i have this problem that she only sleeps on my lap….what should i do abt it? I read all the previous questions and answers and it was really helpful. I have a two +months old lab. I have made him a comfortable bed besides my own bed. But he always want to sleep in my bed. If I don’t allow he makes a lot of noise. What should I do? Also, as he grows up should I leash him or put him in cage at night? Also I mean no offence but I gotta tell you the meaning of your name in Hindi used in India: a pippa is a metallic container built of iron or steel used for storing stuff. Hehe.